Founded In: Ponkunnam, Kottayam Dist, Kerala, India. 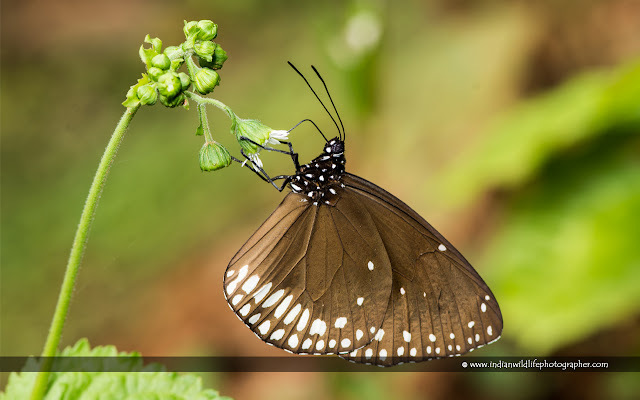 Euploea klugii, the brown king crow, is a butterfly found in India and Southeast Asia that belongs to the crows and tigers, that is, the danaid group of the brush-footed butterflies family. Male: Forewing very variable in shape, especially in the outline of the termen and dorsum. In the type it is comparatively long in proportion to width owing to the less convexity of the dorsal margin, and has the termen oblique, slightly convex; in var. novarae it is remarkably broad, the great convexity of the dorsal margin making it almost subquadrate, while the termen is more convex than in the typical form. In the female the difference is less marked. Typical form. Upperside: fore wing dark brown suffused up to the terinen with a brilliant blue gloss; a spot iu apex of cell, a small costal spot, two short streaks beyond apex of cell, and in the female two discal spots: in the six subterminal and terminal series of spots; in the female the latter series wanting: in both sexes the subterminal spots produced inwards. All the spots bluish white in colour. Hind wing umber-brown, the centre glossed with blue; subterminal rows of spots incomplete or obsolescent, the former reduced to two or three spots below the apex, the latter in the male mere dots; in the female absent, only seen by transparency from the underside. Underside similar, paler brown, not glossed with blue; centre of fore wing dark, spots more clearly defined, subterminal and terminal series more or less complete- Antennae black; head, thorax and abdomen velvety brown, head and thorax speckled with bluish white.